Back in 2005 we bought an 18ft runabout for use primarily at Fish Creek. As per other boat owners, we would moor our boat off shore with anchors and ropes. 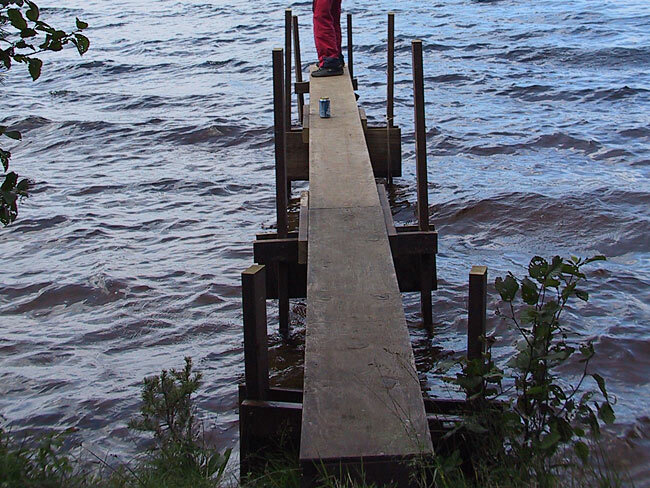 During the winter of 2007 we began to think about building some sort of portable dock to enhance our boating experience, and provide our campsite with a bit more of a 'camp' feel. 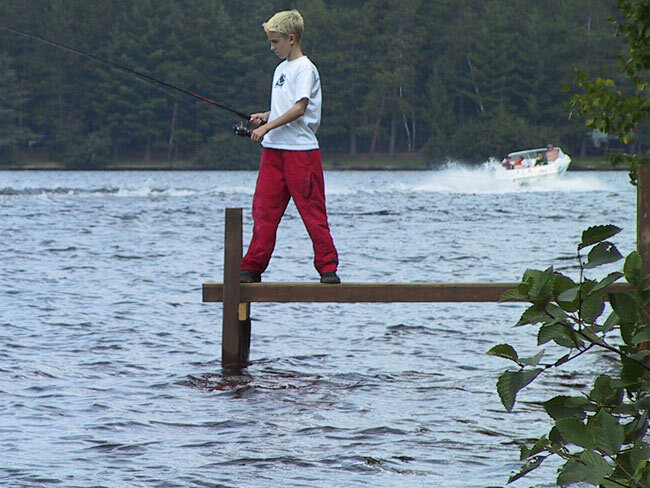 After looking at a variety of docks people have used at Fish Creek, and the work often involved in setting them up, I was looking for an easier solution. 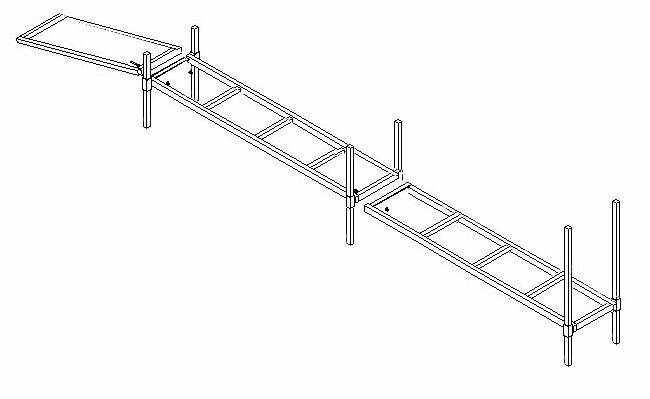 light weight (probably aluminum) for easy transport in our boat, or attached to the boat trailer for transport. 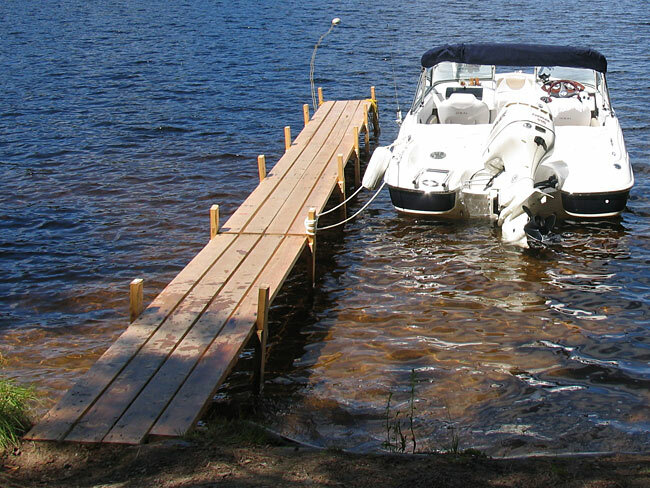 Here is a modifed design based on a dock built by Dockmasters, a local dock builder, outside of Ottawa, Ontario. 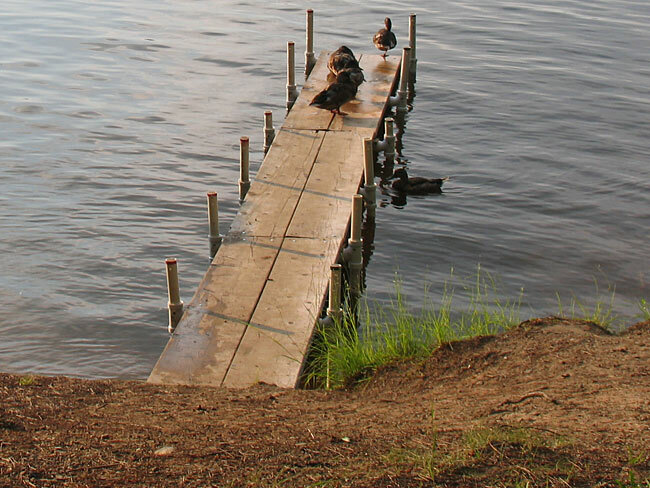 The width of their docks are typically 4 feet wide. I'm looking at about 21-22" wide in 8 foot sections if possible. Stability could be an issue at this width, depending on water depth. If I used a similar design, I wondered what the minimum width of the dock should be to maintain stability without using post that you hammer into the bottom. Or was hammering posts into the pond bottom better than using these style of legs? 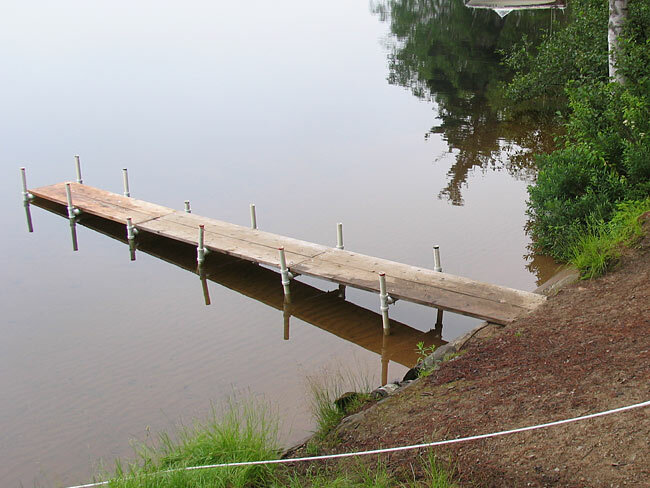 Also what overall dock length would be appropriate to handle the variety of campsite shorelines at Fish Creek? 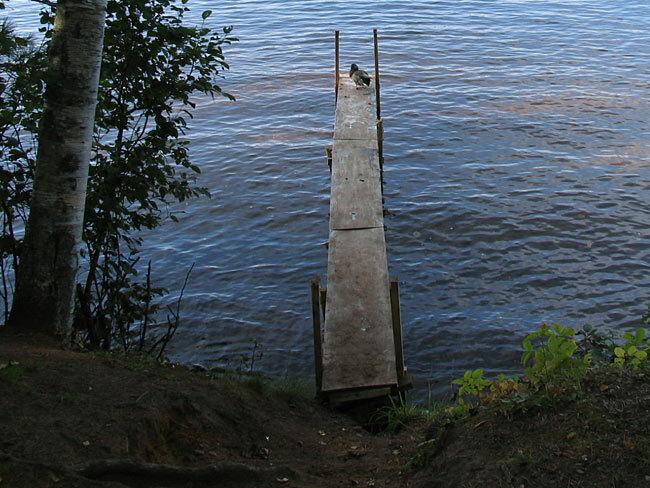 Afterall, it was highly unlikely that we would ever get the same site(s) so the dock would have to be suitable for the majority of campsites. 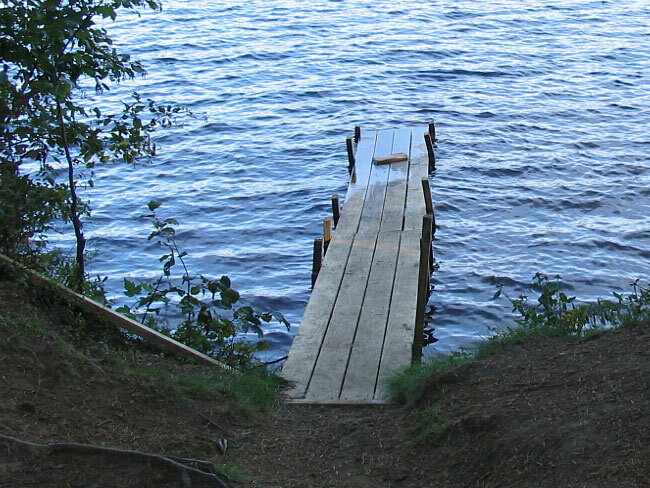 Ideally if I could make sections 8ft long by 22" wide with supports that have a wide stanse at the base, at least at the end of the dock, that would work well for storage inside our boat... in theory. After considering some designs others have used, I thought that I should stick with supports that are driven into the sand like others have done, rather than on pedestals as in the above drawing. 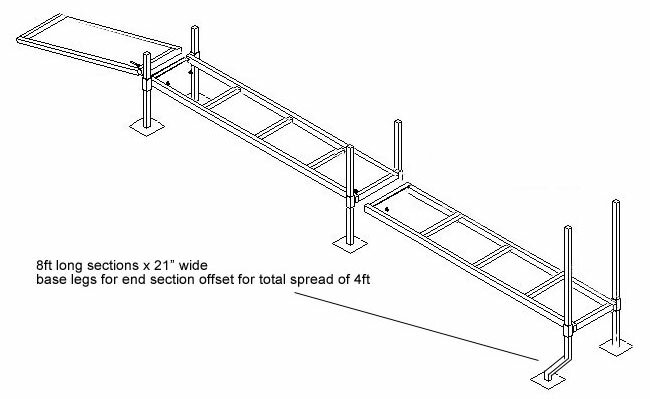 I'll be able to reduce the number of supports compared to docks built out of wood, since I planned on a lightweight, but strong aluminum dock frame. This would also reduce the setup time.